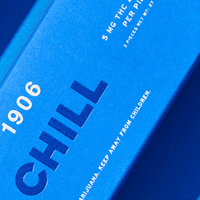 1906 combines the therapeutic effects of low-dose cannabis with the highly-targeted benefits of potent plant medicines. 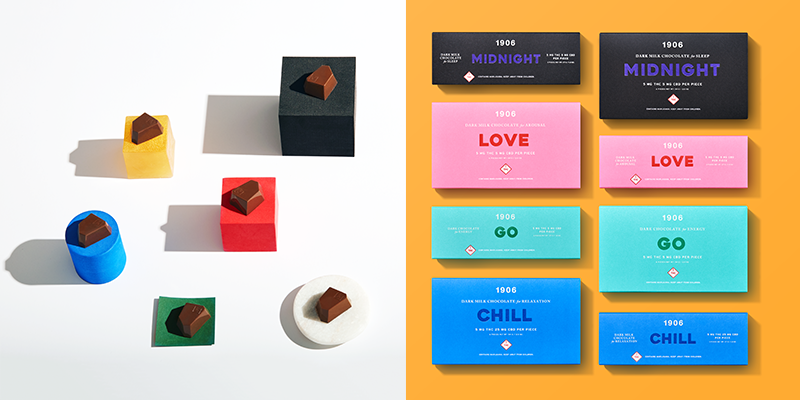 1906 has created six distinct experiences thoughtfully-engineered to help high functioning adults improve energy, relaxation, cognitive function, mood, arousal, or sleep. Using a patented lipid microencapsulation technology, 1906 products deliver an onset time of 20 minutes or less, with no cannabis flavor. 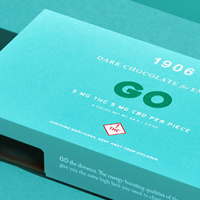 1906 edibles are currently in over 200 stores in Colorado. After raising $15M since inception, 1906 is working to expand to additional states and complete development of more innovative products. 1906 increasingly appeals to an upscale, high-functioning or creatively focused professional. It’s a Lululemon, REI, Whole Foods crowd. This large and lucrative audience segment will soon substitute 1906 products for alcohol, pharmaceuticals, and energy drinks. High functioning cannabis mixed with coffee and energizing herb. Optimized to give your days more productivity and your nights more mojo. Fast acting, long lasting, ultra delicious. A perfectly balanced blend of stress-reducing plant medicines and a relaxing cannabis formulation to promote a calm mind and chill body. 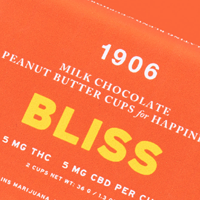 An all-natural euphoric high that will transform your mood and supercharge your day. Highly targeted herbs plus specialized cannabis to give you a bubbly sense of wellbeing and happiness. Don’t sleep with big Pharma. 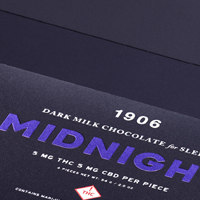 Midnight is a highly effective blend of sleep promoting herbs and relaxing cannabis. A great night of sleep an naturel. 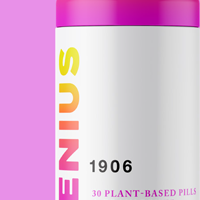 A special blend of plant medicines and cannabis to promote attentional focus, mental clarity, and cognitive performance. 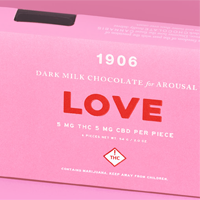 1906 sources the highest quality and most natural ingredients, featuring artisanal chocolate in a groundbreaking formulation that eliminates any cannabis flavor, so all you taste is delicious chocolate. 1906 is currently building a manufacturing facility in Massachusetts and developing the Michigan facility. The company has secured a license partner to expand to Illinois and Ohio and is pursuing a vertically integrated license in New Jersey. 1906 has chosen these states, as well as Florida, for highly strategic reasons including population demographics, geographic reach, and regulatory climates. Prior to founding 1906, Barsoom had an extensive career in finance and business strategy, holding a variety of senior management positions at leading institutions including American Express, Merrill Lynch, Morgan Stanley, BlueMountain Capital and Intercontinental Exchange. In September of 2018, Barsoom was recognized by “Entrepreneur” magazine as one of the Top 100 Leaders in Cannabis. He serves on the board of numerous leading cannabis industry associations including the Marijuana Industry Group, Colorado Leads, and the New Jersey Cannabis Industry Association. A naturopathic physician and herbal and nutrition expert, Forcelli has 16 years of natural products industry experience, a record of researching, developing, and commercializing dietary supplements and functional foods, and an in-depth knowledge of regulatory requirements. Before coming to 1906, she led all product development initiatives at Olly, a category-leading supplement brand, including creating a line of gummies, bars, and probiotic quick-melts for beauty and wellness. A strategic thinker, creative director, marketing specialist, and wordsmith, Larimer brings more than a dozen years of experience shaping and promoting brand identity for some of the most prominent brands in the world, including Target, Apple, YouTube, CLIF Bar, Delta Airlines, Uber, and Nike. She most recently worked for Media Arts Lab (Apple’s ad agency) focusing on brand initiatives, brand voice, and brand strategy. Larimer was a creative director and the lead writer on XQ, the flagship project of Laurene Powell Jobs’ foundation, The Emerson Collective. Holzer came to 1906 after spending nearly a dozen years perfecting his chocolate making expertise, including stints as Chief Chocolate Maker and Head Engineer at Theo Chocolate where he built Theo’s bean-to-bar chocolate factory, now capable of producing four million pounds of product annually. In chocolate, confectionery, and medicinal marijuana manufacturing, Holzer has been involved in all phases of development, including product development, formulation and design, site selection, ground up factory design, construction management, process design and engineering, and sourcing equipment.